← Vibram 420 Disc Review: Is This Real Life??? They say time flies when you’re having fun- and I think they’re right. When it came to my introduction to the Discmania G-Line PD, time wasn’t the only thing flying. I received the G-Line PD a few days before it was released, and remember thinking I just might have a decent review written up the same week the first run is released (May 23rd, 2014)… but here we are in mid to late June and I’m still wanting more time with it. To be clear: this is a good thing. I love this disc. With every new disc there’s a learning curve, and since I love plastic, I tend to love it and then eventually leave it. My bag is essentially Wraith and Leopard based, so any disc fighting for space near them will lose at some point. 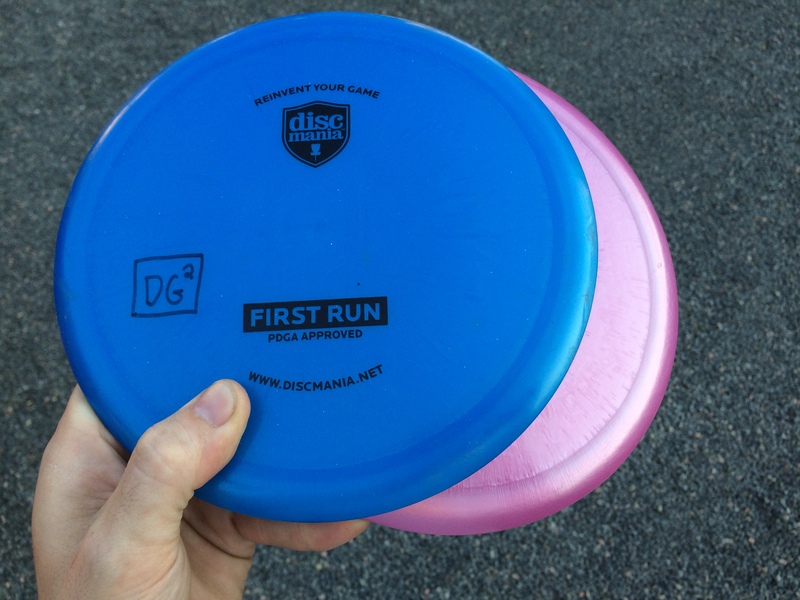 I had never thrown the Discmania PD prior to getting two first run G-line PD’s (one 166g and one 175g). I had seen and read that other people enjoyed them, even Will Schusterick had a signature C-line PD released. My assumption was that it was just a beefy Teebird and I wasn’t too intrigued. When I actually tried it out however, it was “love at first toss.” I grabbed the blue 166g disc, stepped away from my bag, found where the headwind was, aimed myself directly into it and ripped it level. “Wow…” was all I could say as I saw the disc cruise straight, hint at a high speed turn, and keep going straight until eventually it slowed down and hooked up with a hyzer fade to the left. I didn’t break any personal distance records or anything, but the amount of raw power I put into that throw would normally not yield great results; especially into a headwind. …and this was how I approached the disc for the first week: just rip it. Time after time the PD rose to the occasion and flew dead straight. A few things I should clarify: I wound up only really throwing the 166g one. The max weight 175g G-line PD took another level of power that I don’t think I have. But I see this as a good thing, because I can tell you for certain that the lighter weights in this disc hold up to serious torque and snap. This brings me to another point with snap- a fellow NEFA guy pointed out to me that when he throws his G-Star discs (Innova=G-Star/Discmania=G-Line) he gets a wicked snap which makes his throws glide more. I definitely feel this effect when throwing the G-line PD. The size of the rim is similar to a Innova Firebird and Teebird, so you really get a strong grasp of the rim when you’re using a power grip. 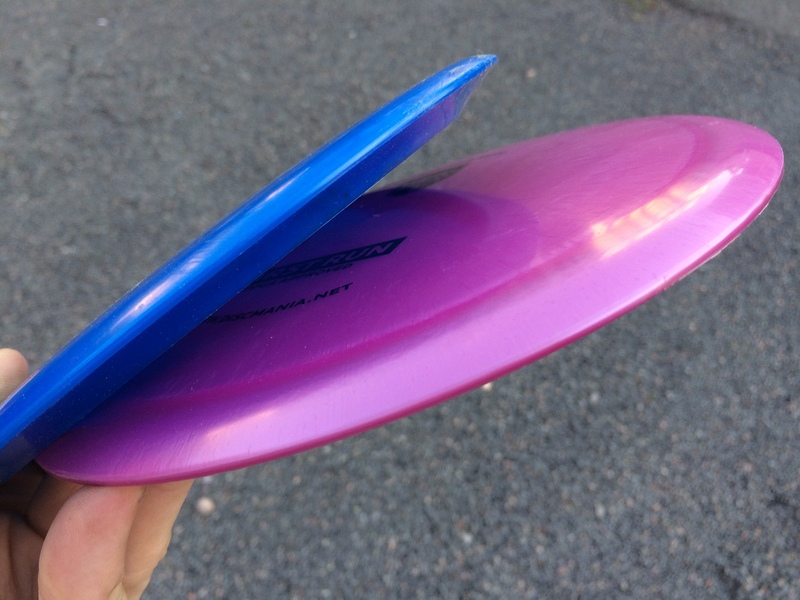 The disc itself is faster than a Teebird, and for me, much longer. I can throw a Teebird a decent distance, but if I’m going to get over 300 feet with a Teebird it needs to be a perfectly executed throw. I think the slower speed doesn’t let you get away with the rookie mistakes with form and execution. For whatever reason though, the G-line PD is a disc I can flat-out mash. If you’re not familiar with the different plastic types, you should check out Discmania’s website and read their descriptions. The G-line is essentially the same as G-star, and it is a grippy, flexible plastic that is manufactured (at this point) with a bit of sparkle in the blend. It is a bit stiffer and flies more stable than Discraft’s FLX blend. In terms of specific throws that come to mind, there’s a 300 foot hole at Pye Brook, #12, that plays uphill about 10 feet and the shape of the hill between you and the basket is a bit of a mound. I’m always trying to reach back and throw a bomb to make it over the hump, but lately I’ve been going long with my Wraith and leaving myself with a difficult comeback putt from the woods behind the hole. When I drive this hole with my Teebird, or hyzer-flip a Leopard, I am woefully short of a birdie attempt. The basket sits on the edge of a slope, so a jump putt from 60 feet short is not a good idea. Thankfully, the PD has worked it’s way right into that void for me. I can throw it with the same intentions of a Teebird, but I get more distance. In reality, the PD is not a “fairway” driver as much as a “control” driver. It’s a notch below a distance driver. Other discs of comparable speed and make-up are the Lat 64 Saint, the Innova Orc, and even the Lat64 Striker. It’s got a full rim, but not a wide wing that makes you feel like you’re holding a suitcase. You probably don’t need a lesson on the Discmania PD in general (as I did), but more so a first hand account for what it’s like in G-line. I’d say it’s a winner. I went out and bought a pair of S-line PD’s to compare to this first run G-line because I was so impressed. I wanted to make sure the PD was going to fly that well in all plastics. It definitely flies great in all plastics, but I will say I prefer the G-line version. The grip feels better, and I personally don’t like the C-line style candy plastics (Champion, Z, etc…) as much when they get into stiffer blends. They feel like they don’t do as much work in the air as the Star, S-line and G-line plastics. This disc is worth a whirl if you’re a fan of the PD, and it’s also worth trying if you’ve never thrown a PD. I risk sounding like a sales pitch here (oh well, too late! ), but if you come find me this weekend playing in my local tournament, you’ll see a blue first-run, G-Line PD stuck in my bag. If you don’t see it in my bag, just look for the closest basket because it’ll be flying directly towards it in a straight line. 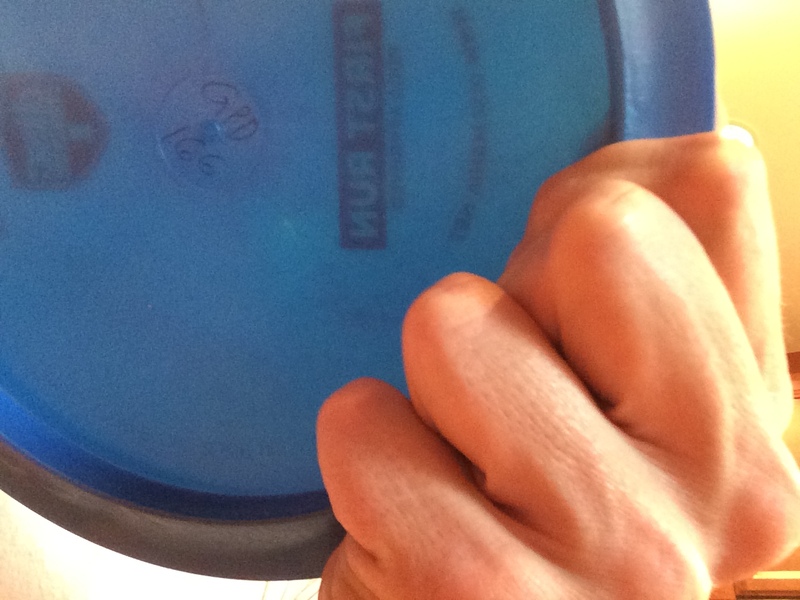 This entry was posted in Equipment and Gear and tagged disc, discmania, equipment, freak, g, gear, gline, golf, line, pd, review. Bookmark the permalink.